Winter Wonders 2012 (Plaisirs D’hiver) festival was one of the major attractions in the centre of Brussels this Christmas. Thousands of people took leisurely strolls along the festive route between Place Saint-Jean and Marché au Poissons in a welcoming, dazzling and magical atmosphere typical of festivals at this time of year. The illuminated and sound-filled setting featured a wide range of fun activities (including street theatre, ice skating, music bands, and puppets etc. ), as well as several large digital signage solutions. The Christmas holidays are also an important time for many businesses who rely on the busy trade to boost profits before the end of the year. And this year at the Winter Wonders festival, Christmas shoppers were also greeted by several spectacular LED walls installed before the holiday rush to boost trade advertising and public information and entertainment. The annual Integrated Systems Europe trade show is always a highlight for our team, because it brings together so many experts and so much great technology. 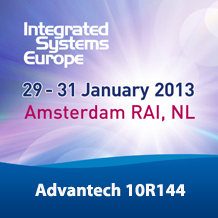 ISE 2013, Jan. 29-31 in Amsterdam, will be particularly big because one of our products is an awards finalist, and one of our top people will be speaking. It’s also the 10th anniversary of a show many regard as the biggest of its kind globally. In the second part of this interview, Bas has further elaborated the applicability of Advantech solutions in the current digital signage industry. In which area or market do you think Advantech’s products can be the most competitive? Bas: Our products can actually be competitive in every market. For example, in retail, we present the reliability of our products as an advantage. In open areas such as supermarkets and stores, the signage display needs to be available all the time. Therefore, reliability really stands out as a crucial factor for users; a broken system or one that performs poorly will not draw customers. Having a standardized model is also good for large quantity purchases. We strive to make our products indispensable to our customers.